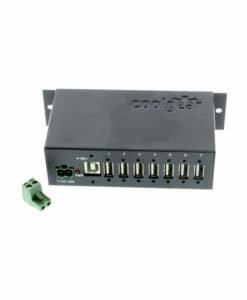 This versatile industrial USB 16-port HubCOM provides 8 USB 2.0 downstream ports and 8 USB to RS-232 serial ports. There are no IRQ & COM port conflicts, uses lockable terminal power connector to supply 5V, 3A power to external device. Designed with Over-Current detection and protection for USB circuits. Powered by a switching power supply and supports USB 2.0 High Speed, USB 1.1 Full Speed, and USB 1.0 Low Speed. RS232 ports at a native Windows COM port and is automatically detected. The HubCOM-880i-RM is a rugged, industrial-grade Rack Mountable USB 16-Port combo hub consisting of 8 USB to RS-232 serial ports and 8 ports industrial USB 2.0 hub. This USB serial combo hub is compliant with USB 2.0 specification, it expands one USB host port into a combination of 8 high-speed RS-232 serial ports and 8 highly-efficient USB 2.0 ports. This industrial-grade HubCOM supports USB 2.0 high speed of 480 Mbps, USB 1.1 full speed of 12 Mbps, and low speed of 1.5 Mbps. It is powered by a quality industrial-grade switching power supply. The HubCOM-880i-RM USB Hub is designed to make RS-232 serial port expansion fast and uncomplicated, in addition to adding 8 USB 2.0 downstream ports for easy USB ports expansion. The HubCOM-880i-RM is automatically detected and installed to the system once connected, no additional memory resources are used on the system. Each downstream USB port supplies 5V 500mA power for external high-power USB devices. parity and RTS/CTS, XON/XOFF flow control, transmit and receive FIFO size, etc. case with screw holes on each USB port for lockable USB and power cables. Next to each USB downstream port connector are two screw holes for lockable USB cables to add extra reliability of connection. The terminal power input connector has two screw holes securely locking the power wires to prevent them from accidental disconnection. The USB to Serial Hub Combo incorporates the USB hub chips specifically for industrial usage. Each downstream port provides full 500mA power to the connected USB devices. This HubCOM is featured with normal operation in wide ambient temperature from -40°C to 70°C (-40°F to 158°F) operation in a harsh environment. All the USB data lines and RS-232 signals are protected by 15KV ESD protection. 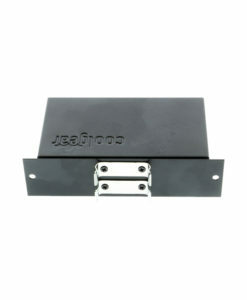 The Rack Mount 8 port serial hub has certain accessories that work with it. These accessories are what you can order if needed.